LeBron James' hometown is Akron, Ohio, where he played high school basketball at St. Vincent–St. Mary High School. Today, he is ranked as one of America's most influential and popular athletes playing professional basketball for the Cleveland Cavaliers where he is their all-time leading scorer. But life hasn't always been so easy for LeBron. He grew up in the poorer neighborhoods of Akron and moved from one apartment to another. 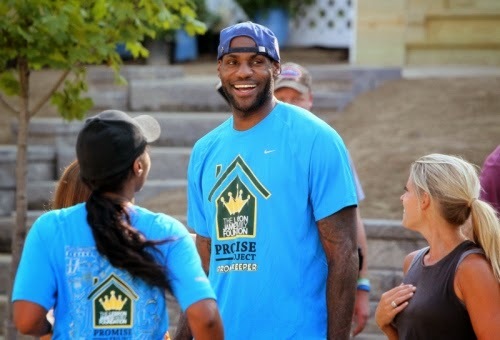 Now LeBron wants to help other youth by partnering with HGTV's Nicole Curtis to rehabilitate housing in Akron. Nicole Curtis is the star of TV’s Rehab Addict reality show where she rehabilitates homes in the Detroit and Minneapolis areas. She just announced that she will be teaming up with LeBron to do the same thing in Akron with LeBron. The two will work together to renovate the home of a middle-school student and her family as well as improving the yards for nine other Akron families. The effort is called the Promise Project. The project will be supported through the LeBron James Family Foundation and is part of James’ Wheels for Education mentoring program which provides academic support and mentoring to children as young as the third grade. Students who enter the program can then progress to the next level by entering the I Promise Network which supports students from middle school through high school. What is LeBron James' motive? To help provide stable housing for children in his hometown, something he did not have while growing up. Michele Campbell, the executive director of the LeBron James Family Foundation, comments, “I think LeBron is very proud of his hometown," "hes always given back to his hometown and never forgotten where he’s come from."